Oh what a glorious day! 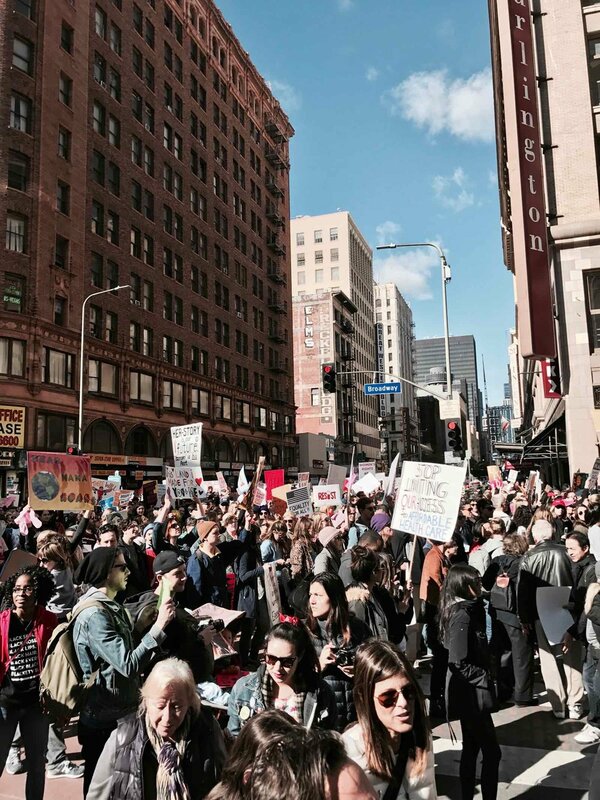 An estimated 750,000 people attended the Women's March Los Angeles. I admit I spent more time waiting on line for a bathroom and the subway than actually walking. Still, the energy was glorious, and seeing the support around the world takes my breath away. We stopped for a break in the middle of everything to eat at Clifton's Republic (formerly named Clifton's Cafeteria). I photographed the jello, but Abe and I split a special vegetarian sandwich for lunch. It came with three types of cheese (cheddar, gouda, and brie) and wasn't even on their menu. It was the size of my head and tasted like heaven. Do you remember my friend who I unfriended on Facebook the day after the election? I apologized to her just a couple days after I wrote that post. She and I had a really long discussion over a lot of tears. We are still friends, and we still have different opinions. I am trying. I vow to keep trying. It's difficult but there is beauty in all of this. I'm going to bottle up the feelings of today whenever I need a reminder to keep on going.